Buried Treasure from Roman Britain | Worldbuilding Rules! What’s the late Roman version of a safe deposit box? A buried clay jar full of cash, of course. 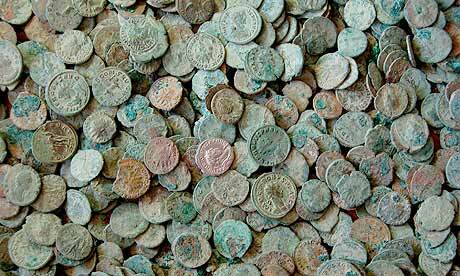 Less than a year after the discovery of the Staffordshire Hoard, another lucky British treasure hunter has found an enormous hoard of late Roman coins, some 52,000 of them, buried in a jar in a field in southwestern England. Here’s a good article in the Daily Mail about the find, with some historical information about the Roman era when the coins were buried. And here’s a short slideshow with more pictures of the hoard. How much wealth do 52,000 silver and bronze coins represent? 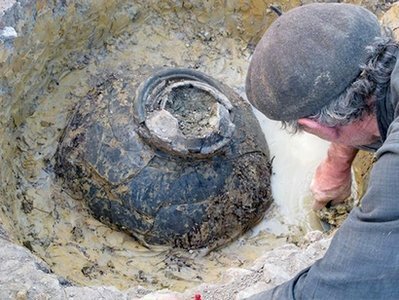 The experts speculate it was probably the life savings of an entire community. The coins weigh over 350 pounds (160 kilos) – so heavy that they would have to be put in the jar after it was set in the ground, or the weight would have broken the jar. The Roman idea of wealth- a stash of all the coins one can lay hands on – is a familiar one to us (though perhaps less familiar than it was before the credit card and the electronic transfer). Roman society used currency as its most common and liquid form of wealth, and the Empire was big enough, and organized enough, that its currency, like ours, was accepted over a wide geographic area. So stand that value on its head: what else can a society use as a measure of wealth and a way of storing it against an uncertain future? Land, jewelry, natural resources – these are all the easy ones. Think of some other measures of wealth and value. Even in our cash-driven society, we accept the notion that family members are of more value than cash, or there would be no ransom kidnappings; and no families bankrupting themselves to pay for life-saving or life prolonging medical care for one relative. To upset the apple cart even farther, ask yourself what kind of society would not even see the value of hoarding wealth? Or perhaps would have strong taboos that favor giving instead of hoarding? I can think of a few from history, such as the potlatch type economy, where status is gained by giving away large amounts of wealth; or the gift economy of the early Middle Ages, where kings and lords offered treasure, jobs and lands in return for sworn fealty and service. The reasons for burying the treasure start another whole line of worldbuilding speculation. There are no known Roman sites near its hiding place, so some group of people, 17 centuries ago, carried 350 pounds of silver out to what, even then, was the middle of nowhere, buried it deep, and never came back for it. Why? Since the whole project would require planning and organization, it can’t have been a hasty attempt to hide the silver from a plundering warlord. So what would drive people to take such an extreme step? Were they trying to hide the community’s wealth from the Emperor’s tax collectors? Sacrificing to the gods, in the hope of safety or prosperity – or hoping to avert their wrath at some sacrilege? Those are possibilities for Roman Britain. Why might people in a different world bury all their wealth forever?